Surplus RV Mega Sale! SAVE UP TO $17,000!!! 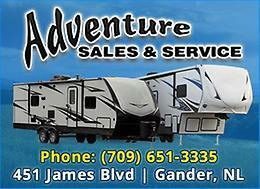 Adventure Sales & Service SURPLUS RV MEGA SALE!!! Yes these savings are MEGA! Save up to$17,000! These brand new campers are IN STOCK and ready to roll! Adventure Sales & Service at 451 James BLVD has the perfect deal for you! Maybe you're just starting out and you want a good travel trailer to start your family's first foray into camping... Or maybe you're an experienced camper and want something with a little luxury and some more amenities... Either way, we've got what you need, and at greatMEGA SALE prices! And at Adventure Sales there areNEVER Freight/PDI Charges! Coachmen Freedom Express 320BHDSLE The Freedom Express 320BHDSLE is comfort and practicality combined: * At 32 feet long, you've got lots of room for the entire family! * The bunk house is the kids own space, with a wardrobe and TV area. The futon fold outs into an additional bed and above this is another flip-up bunk, so you can sleep 4 kids with room for more! * Mom and Dad get their own bedroom with a walk-around queen size bed and direct access to the bathroom and shower. * The full bathroom has a toilet, sink and shower so you're all set for extended camping trips. * The kitchen area is great with everything at your fingertips, including your double sink in an island counter space! * Dining and entertainment space is very comfortable with a double slide-out for the dinette and sofa. Not to mention that these both convert to beds when friends are staying over! * Storage is not a concern with lots of overhead cabinets, a pantry and a step-in closet. Not to mention ample pass-through storage space under the bed. * Plus, this travel trailer is IN STOCK so you can see it, buy it and tow it away today! * Call 709-651-3335 to talk to us today! More on this great travel trailer: * 10.7 cubic ft 12V refrigerator * 60" x 80" Queen Bed * LED illuminated power awning * Dual 20lb Propane Tanks * Azdel composite construction * 7952 lb dry weight * Freedom Value Package! * Save $2000!!! * Now only $48,999 + tax OR * $198 bi-weekly (tax and licensing INCLUDED) Keystone Cougar 29BHS The Cougar 29BHS by Keystone has everything your family needs! * Double-Size bunk beds for the kids * A separate bedroom with a King-Size bed for mom and dad * Outdoor access to the washroom - great for when you're outside by the fire * YES, this travel trailer is also IN STOCK so you can take it home (or to the park) today! * Drop into 451 James Blvd in Gander to see this lovely travel trailer for yourself. You'll see that campers have come a long way! More on this great travel trailer: * 8 cubic ft 12V refrigerator * 13,500 BTU Air Conditioning * Outside Kitchen * Dual 30lb Propane Tanks * Auto Leveling System * 7008 lb dry weight * "Camping in style" Package! * Save $13000!!! * Now only $37,999 + tax OR * $154 bi-weekly (tax and licensing INCLUDED) Keystone Sprinter 332DEN The Sprinter 332DEN by Keystone will make your outdoors adventure a luxurious one! * Ideal for couples who want the fun of camping but the comfort and amenities of a high-end camper to do it in! * A large bathroom, including a comfortable radius shower * Sleep better than the other campers in the park with a residential Queen-Size bed * Enjoy movie and tv time from your Theatre Seating loveseat, complete with drink holders! * This trailer is IN STOCK too! No waiting for weeks to get your camper, you can hook it up and tow it away today... * Just call 709-651-3335 for more details, or drop into 451 James Blvd for a tour of our many in-stock travel trailers. More on this amazing travel trailer: * Luxury package * 8 cubic ft refrigerator * 13,500 BTU Air Conditioning * 55" HD TV * Fireplace * 60" x 80" Queen Bed * 8300 lb dry weight * "Camping made easy" Package! * Save $5,500!!! * Now only $44,999 + tax OR * $182 bi-weekly (tax and licensing INCLUDED) Coachmen Catalina 293RLDS The Catalina 293RLDS is the ideal RV for couples who want high-quality but not high-prices. * The entire camper is done throughout with beautiful flooring and lovely decor. * Enjoy the mud and the muck AND keep the camper clean by rinsing off with the outside shower. * Just the two of you can relax in front of the TV in dual recliners, or * Entertain your camping buddies with a large spacious living room area! * And comfort is guaranteed with your Queen-Size bed and Large Shower. * YES, this travel trailer is IN STOCK so you can take it home (or straight to the park) today! * Drop into 451 James Blvd in Gander to see this quality travel trailer in person. Or call us at651-3335 and we'll explain why camping doesn't mean roughing it anymore! More on this great travel trailer: * 15,000 BTU Air Conditioning * LED TV * Outdoor Kitchen * LED Lighting * 7530 lb dry weight * Power tongue jacks * Legacy Edition * Save $5,600!!! * Now just $39,999 + tax OR * $162 bi-weekly (tax and licensing INCLUDED) Keystone Montana 364BH The Montana 364BH Luxury Fifth Wheel family camper. * This camper is a massive 36.4 ft of luxury living space! * An extra large bedroom with a slide-out makes for a great retreat for Mom and Dad. * The large full bathroom is right next to the parents bedroom. * A separate, large bunkhouse in the back provides a great spot for the kids with their own bathroom. * Enjoy the outdoors even more with a large outdoor kitchen (including a microwave). * So you can tow even more fun stuff with you, the Montana includes an installed receiver hitch. * YES, this travel trailer is also IN STOCK but act quickly before it's gone!!! * Drop into 451 James Blvd in Gander to see this luxury travel trailer for yourself. Camping and luxury can go so well together! More on this great travel trailer: * Large 12 cubic ft Refrigerator * 15,000 BTU Air Conditioning * HD LED TV * Theatre Seating * King-Size Bed * Extra Large Entry door * 13,000 lb dry weight * High Country 4 Season Living package * And INCLUDES a 6 Year Warranty! * Save $17,000!!! * Now on sale for $64,999 + tax OR * $261 bi-weekly (tax and licensing INCLUDED) We've got a SURPLUS! They say you can never have too much of a good thing...but we have dozens of Surplus RV's and we need to move them out! That's why we're having thisMEGA SALE! If you don't see the camper you want in this ad - don't worry, just drop in to see us or call 651-3335 today so we can help you pick the camper that fits you and your family! WE DO NOT CHARGE FREIGHT OR PDI FEE!!! Most RV dealers do, so check with us before buying your travel trailer! We are Adventure Sales & Service and you'll find us in Gander at 451 James BLVD and everywhere at Adventure Sales & Service sells some of the best RVs, but we sell a lot more too!!! Click to check out our showcase of ATVs, Boats, Motorcycles and more on NLClassifieds. Looking for someone to take over payments or buy out for what’s left owing! Barely used for 2 summers! Has 2 slide outs with bunk house! Outdoor kitchen with bbq attached! Separate door to bathroom to access from outside! Approximately 34ft! Please call or email for more information! Serious inquiries only!! 2019 Wildwood 31KQBTS Triple Slide with Huge Bunkroom. Only $149 Biweekly! Finance for only $149 biweekly tax included. Our most popular travel trailer. Three slides with two in the bunkroom. Loaded with features including outside kitchen, u dinette, power awning with LED lights, power tongue jack, power stabilizers, 32" TV, A/C, stainless steel kitchen package, leather interior package, remote (controls slide, awning, lights and stabilizer jacks, outside shower and outside speakers. Includes weight distribution towing kit and starter accessories. Free winter storage available with delayed warranty until Spring. 1000w Inverter/charge, plus the 25 foot power cord- $100. Great condition. Taken out of a hardtop camper. 28 ft ultralite. 5500lbs. awning. Queen bed in front. Jack and jill bunks in rear. Pull out couch. Sleeps 9 if you have to. Winterized. Weight distribution hitch included. Only towed 2x per year to seasonal site then storage. For sale....2011 Maxum Wild 28’ Travel Trailer in excellent condition. Sleeps 8. Trailer has 1 slide with queen bed in front and single over double bunk in rear. Must be seen to be appreciated. 2002 Prowler Travel Trailer 22ft. Sleeps 5. Has a double bed with a single bunk above it. The couch folds out into another double bed. Can be towed with an SUV. Includes hitch swaybar attachments. Three burner stove & oven. Two way fridge, hot water boiler; propane tanks, batteries. Roof was resealed last year with recomended RV coating. Available for viewing 2 Alder Place, Apr 20-28, then gone to Florida. Price is negotiable o.n.o. B&W Companion 3500 Goose Neck Fifth Wheel hitch. Mounts in place of goose neck ball. Great quality hitch used one season. Check manufacturer website for full specs and ratings. 2011 trail sport travel trailer. In perfect condition and everything works as it should. Lightly used. One slide with couch. Queen bedroom up front.lite weight. 25 feet and easy to manage. Great for a couple, no bunks only drop down table for guests. 2 new propane tanks new battery and hitch Inc.
No reasonable offer ignored!! 2008 Keystone Hornet 30BHS Used lightly and in excellent shape. Reason for selling: kids are growing older and no reason to keep it. One large power slide Bunkhouse at the rear Large living area Just registered so good until next April We bought the trailer in 2010. Had no issues whatsoever. Everything is dry and no leaks. Well taken care of. Very low mileage only back and forth to campground 20 minutes outside of town. Please email if interested. Just coming out of storage and need to do some cleaning before selling but this will sell fast. For sale 2004 30ft Travel Trailer - Trail Cruiser Lite by R-Vision. Full slide-out Sleeps 9.. In very good condition. ($7900 neg) total trailer weight 4300 lbs. Well taken care of..lots of room for growing family. 2009 wildwood le 26ft Queen bed up front, triple bunks, super slide, couch that folds out to double bed and table that folds down to double bed, bath tub and shower, outside shower, propane furnace,stove and A/C, has awning, 4 new tires 2 years ago also has new battery last year, one new 30lbs propane tank! Well taken care of and always stored on concrete pad during winter season and all ready for summer season!! If interested please call 728-3842!! 2008 hideout 27le bunkhouse travel trailer sleeps 9 excellent condition 2 30lb tanks includes hitch 10000.00 Ono must sell . 24ft Terry Travel trailer. Sleeps 8. Pull out awning. Comes with full bathroom, fridge stove and oven. Plenty of stoage space inside. Very clean and Comes from a smoke free environment. Needs to be viewed to be appreciated. No leaks. In excellent shape. sleeps 6. Large double slide out. Large awning. New battery. Power front leveling jacks. Spare tire and cover. Large fridge and microwave. Front queen size bed and loads of storage. Very spacious inside. Very clean. Never smoked in. Call 885-2039 for more info.